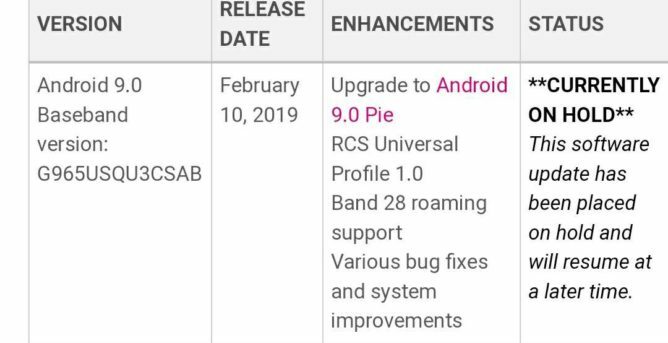 It may be the last major network operator in the US to push its Android 9 Pie update out to Samsung Galaxy S9 and S9 + units, but T-Mobile can at least boast the inclusion of support for RCS Universal Profile 1.0 with its build . The un-carrier has added the next-gen SMS service to a number of Samsung handsets already, so it's no surprise to see it arrive on the Galaxy S9 and S9 +. Samsung's latest design language One UI is the other major draw in this update, as well as all the goodies that come with the Pie Android release. It's the biggest overhaul to the look and feel of Samsung software in years, and the feedback has been mostly positive so far. 1; it's a staggered launch, as usual. Baseband version numbers are G960USQU3CSAB for the S9 and G965USQU3CSAB for the S9 +. The Pie / RCS update was pulled today, with T-Mobile stating that it's on hold. It does not appear that anyone's received the update at all. This is likely due to some last-minute bugs that were discovered, so T-Mobile S9 owners will have to sit tight. The Pie / RCS update is rolling out now to T-Mobile S9 and S9 + owners, much to the delight of many subscribers to the r / tmobile subreddit. It comes in at nearly 2GB with the January security patch in tow.